Details on a handful of the hottest crappie-producing spots in Louisiana — and tips for you to catch some slabs. Football fans are probably still discussing (and cussing) the recent College Football Playoffs, where a champion was crowned from the best of the best. But now it’s time to discuss another type of Bayou State CFP: The Crappie Fishing Playoffs. Our committee considered credentials, strength of creel, results in head-to-head competition and overall performance. The results are in, and we picked the Top 5 Louisiana crappie lakes in the state. So let the discussing (and cussing) and, of course, the fishing begin …. Probably not too many — but Ed Terry could. 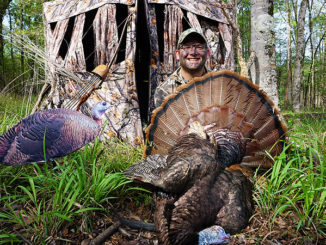 Terry’s home is in New Orleans, but he “lives” on Toledo Bend pretty much from February through the end of October. 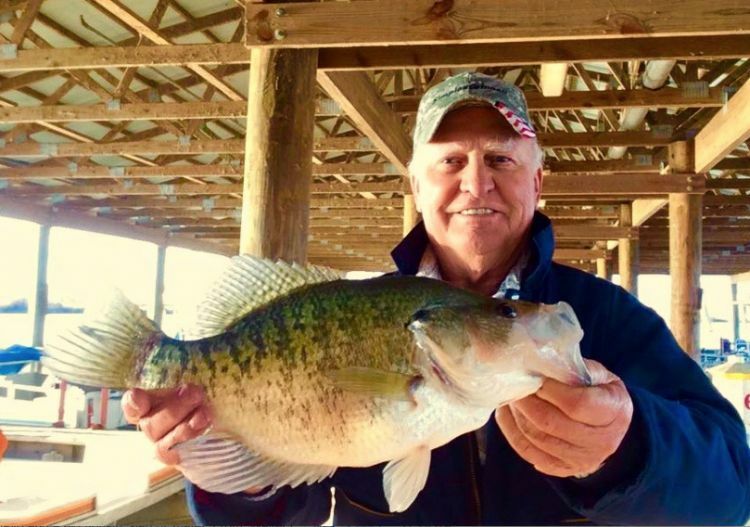 While he’s only been a full-time guide on the big 190,000-acre reservoir on the Louisiana-Texas border for two years, he’s a veteran of crappie fishing the Bend for much of his life. In 2017, he made 230 guided trips — and he and his clients brought home an average of 40-plus fish each trip. They caught many, many more — so you do the math. 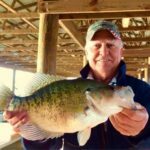 “That’s why I can say unequivocally that Toledo Bend is the best crappie fishing lake in the state, maybe anywhere,” Terry says. “It’s just the numbers of fish. I’m not the only one that does that. And when certain areas like the Chicken Coop line up, it’s just amazing how many fishermen are out there catching how many fish. The coldest weather of the year drives fish to congregate over structure or schools of shad in the deeper waters of Toledo Bend, in areas like the Chicken Coop north of Pendleton Bridge. There is not as much deep water on the north end of the reservoir as there is the south end. 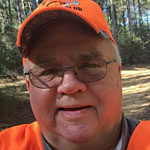 Therefore, Terry says, the numbers of fish that gather in the channels is more concentrated than on the south end — where there is much more deeper water to choose from. 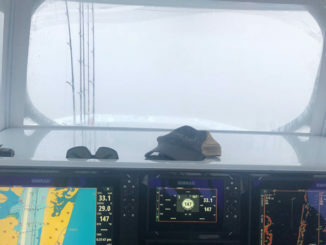 “Everybody knows about the Chicken Coop, and when the weather, the water level and the temperatures line up, you can walk from boat to boat in there for several weeks,” he said. Two things Terry keys on are water surface temperatures around 55 degrees (which mean it’s much colder 20 feet down), and a stable water level around 186 to 187 feet. When those conditions line up, you’ve just got to locate the schools of crappie on your electronics and get the bait down to them. There are lots of baits that work, but it’s hard to beat shiners. Terry also likes to fish Bobby Garland jigs in monkey milk, electric chicken and Cajun grasshopper. 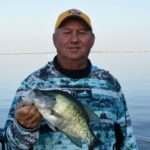 Because of the sheer number of crappie on the lake, you can catch fish starting to head into shallower water at different times of the spring. Some fish apparently don’t ever move shallow, and are caught around the river channels all spring long. But the norm is for the fish to begin to move in to spawn when the water temperatures reach the 60s. You can also catch them all the way up to 2 feet deep around the shorelines and cover there. Again, the best cover is grass beds with clear spots in them for the crappie to spawn. When they hit those areas, there is nothing better to catch them with than Road Runner lures in white or chartreuse colors. As the year warms up, the fish head to tops, many of which are placed by anglers like Terry. The shad gather there and the crappie follow. Matching any other Louisiana lake against monster-sized Toledo Bend doesn’t seem fair. But if any lake could make a run at that Goliath, it would be 16,000-acre Lake D’Arbonne in Union Parish. Anglers on this lake score more 1.5- to 2-pound crappie than anywhere, especially when you consider the size of the lake. Smaller fish are everywhere. The fact that two national crappie tours — Crappie Masters and the American Crappie Trail — make tournament stops at the lake speak volumes. In 2019, ACT will even hold its National Championship on the ‘Bone — a tournament that will award in excess of $125,000 in cash and prizes. 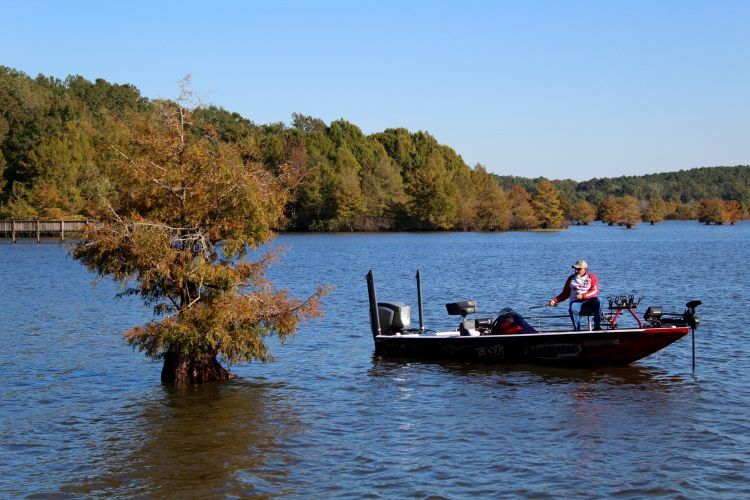 The fact is, D’Arbonne is a miniature Toledo Bend, with a river channel that concentrates the fish in the winter, miles of shallow shoreline and trees that draw spawning fish in the spring, and stump-filled flats and tops that produce fish all spring and summer. “There are three ways you’ll catch fish here for the next several months and they are all good,” Steve Danna said. And Danna’s no ordinary crappie chaser. He lives on D’Arbonne, but travels to fish both pro circuits, and is a veteran crappie seminar speaker. Here’s how Danna recommends going after them. First, in the channel, he uses a modified spider rig, usually with about four poles. He’ll find shad on the electronics and move with them, keeping his jig just above the fish. On clear days, he likes Garland’s monkey milk, ice blue and blue and pearl colors. On darker days, he goes to a purple and pink Vegas color or pink panther. And he never puts a jig in the water without a chartreuse crappie bite. As the fish move on the ridges, double minnow rigs are popular on the lake, but you can mix those with jigs in the same colors as listed above. He likes going to a two-pole system with one in each hand, working up and down the ridges. His favorite D’Arbonne plan of attack comes when the fish hit the trees. He often switches to one of his hand-tied hair jigs for tree fishing. His favorite colors are blue and chartreuse, blue and pink and crawfish color. Several manufacturers produce those colors and once again, shiners and plastic jigs will also work. His favorite method is to pitch the jig past the tree and let it slowly fall down by the root system. Fish are likely to hit it anywhere on the fall, and sometimes bigger ones will hit it after it has sat there for a few seconds — all you’ll feel is a mushy sensation. Either way, set the hook. 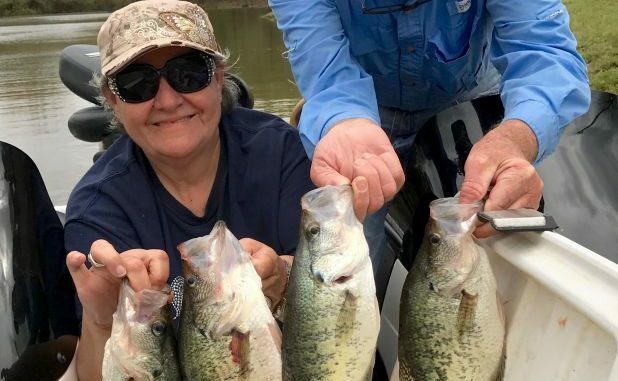 The good thing about D’Arbonne, Danna said, is the quantity of big fish — and the fact that they are literally caught from one end of the lake to the other. Poverty Point Reservoir may not have won the championship, but if there was a Heisman Trophy for individual outstanding performances, the Richland Parish reservoir definitely would take home the hardware. It might seem ironic that we’ve put Poverty Point at No. 3, because it is that very number — three — that keeps this lake near the top of the polls. That’s “3,” as in 3-pound crappie. There’s no doubt fishing on the 2,785-acre mostly open water reservoir isn’t as good as it was for numbers as in the early years after it opened in 2003. 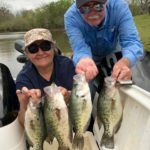 But then, in the spring of 2016, anglers there started rewriting the books on record crappie, with three fish weighing more than 3 pounds caught in just eight days. The first two massive crappie were caught by twin brothers Twayne and Dwayne Hosea. Twayne caught his 3.52-pound slab and set a new lake record. That came just a few days after the duo caught a 2.96 and a 2.91. Then Dwayne pulled up a 3.48 pounder. The lake residents caught their fish — the No. 2 and No. 3-ranked white crappie in the sate — on Bobby Garland Baby Shad jigs. A few days later, reservoir angler Rodger McConnell got in a 3.46 pounder that is No. 4 in the state record books. 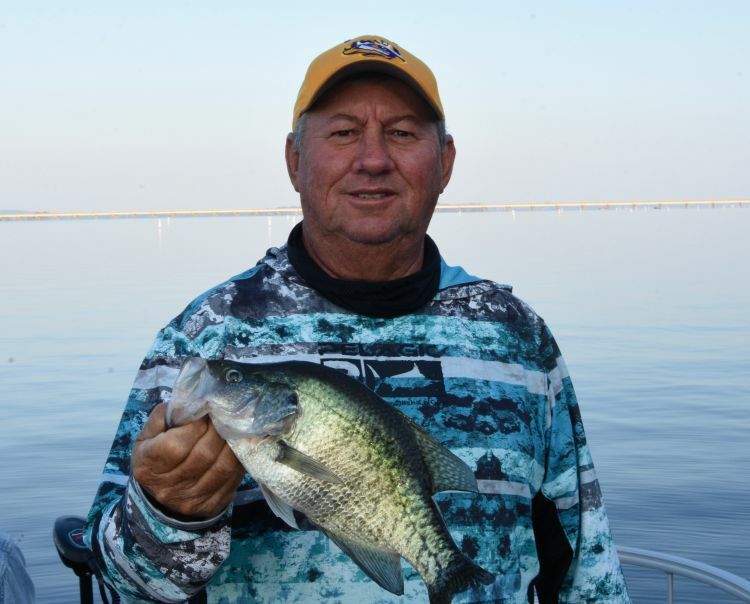 All told, six of the Top 10 white crappie in Louisiana come from Poverty Point — as well as the largest black crappie, a 3.84-pounder caught by Randy Causey in April of 2010. Hosea recommended using electronics to find tops, and then fishing slowly. Some of the best fish are caught in spots where anglers have spent an hour fishing the same structure. 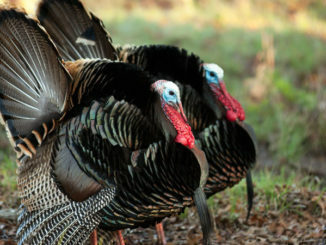 One Hosea hint for catching the big ones — get there early and stay late: That’s when some of the best big bites come. In addition to poles, baits and normal fishing gear, there’s one thing that most Saline-Larto crappie fishermen need on a regular basis — an ice chest. And preferably a big one. “When this place is on, it’s just hard to imagine anything being any better,” the veteran crappie angler said. “And February and March are prime time. It’s championship season. 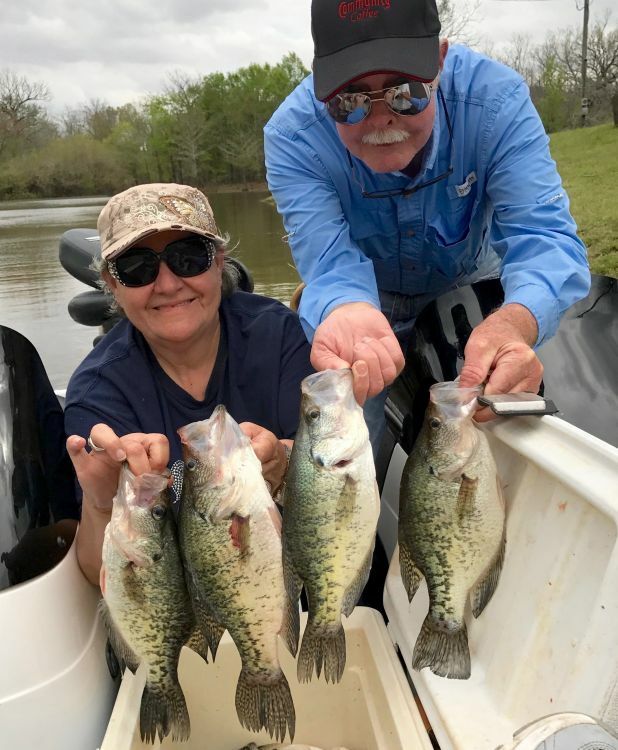 You go to deep channels in Shad Lake, Larto Bayou or Larto Lake, and work that 12- to18-foot-deep water and you’ll catch crappie. This time of year, when you find a few, you’ll usually find a bunch, especially near bait balls of shad. As the water warms, crappie follow traditional patterns on the large backwater complex that regularly receives flood waters from a trio of area rivers. When fish leave the deeper water, they head to the trees — usually the closest trees to the channel. Fuqua says if you catch one crappie by a tree, work it hard: There are usually five to 10 more fish there. But the crappie usually remind you pretty quick when your bait hits the water on the 8,200-acre maze of lakes. Heading into the Atchafalaya Basin looking for crappie is kind of like picking out a ride on a Disney vacation — where do you start? But first, a change in terminology is needed before we get much further. We are now in Cajun crappie country, where the fish are most often called sac-a-lait. And as far as how many sac-a-lait are in the nationls largest freshwater swamp — well, the only word that can cover it is beaucoups. The Basin welcomes sac-a-lait anglers to the wild side in Louisiana, covering almost a million acres of swamps, bayous and backwater lakes — an area almost 20 miles wide and 150 miles long. It’s not full of crappie from one end to the other, but where it’s good, it’s really good. The key to sac-a-lait success in the Basin is watching the water level, Salyers said. If the Atchafalaya River is on a hard rise, you can just about forget catching sight-feeding fish like crappie. The water will be cold and muddy, especially in the early months. For the most part, Salyers said people assume Basin sac-a-lait are mostly small to medium. But the record books show otherwise. The No. 1 white crappie in the state is a 3.8-pounder caught by Tim Ricca in Lake Verret in May of 2010. And the 3.47-pound fourth place black crappie was taken by Floyd Meche in Lake Henderson in 2004. 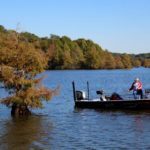 Cypress trees are natural holding areas for crappie, but perhaps the best spots are treetops, or small trees, that have blown over into the water. These tops are havens for big groups of sac-a-lait — and with all the storms late last year, there will be plenty of those tops this spring. Once the water does stabilize in the spring, anglers can also find good crappie holes in the backs of dead-end canals. A word of caution in the Basin, though: It is an ever-changing environment and some areas can silt in, or get blocked by aquatic vegetation. Take care going and coming to your sac-a-lait hot spots.